Keystone 3.0 is coming – prepare now! Our next major release of Keystone–version 3.0–is coming soon. With this release we have updated our development tools to the latest versions which ensure proper support of Windows 10 and future Windows versions going forward. The new versions of our development tools require us to update our minimum system requirements, in terms of the Windows versions that we can support as well as the versions of InterBase (back-end database) that we can support. As we have been warning about for almost a year, if you are using any version of Windows prior to Windows 7/Windows Server 2008 you need to make plans to upgrade as soon as possible. Microsoft no longer provides support for older versions of Windows (such as Windows XP and Windows Server 2003) and that includes no longer providing security updates which are essential in the Internet era. If the ServerVersion is “WI-V10.0” or higher, you are all set. If it is less than that, please contact support for a quote to arrange for an InterBase upgrade as soon as possible. GivenHansco, creator of the award-winning line of Keystone integrated software products for the ready-mix, aggregate and asphalt industries, today announced an exclusive dealership arrangement with Barnes Industrial Group. “We are extremely excited to have the Barnes Industrial Group as our exclusive dealer in the Midwest. Jim (Amelung) and his group have deep industry knowledge and are committed to exceptional customer service just as we are,” said Mike Sanders, GivenHansco President. Barnes Industrial Group (also known as The Barnes Group) is an established distributor of concrete equipment products based in Manchester, Missouri. They are a dealer for CON-E-CO concrete plants and an exclusive dealer for quality equipment and parts with over 30 years of industry experience. “Partnering with GivenHansco will allow us to offer our customers a truly integrated product line that we have not been able to before. Along with batch controls, we can now offer accounting, dispatch and GPS solutions from a company with industry-leading customer service,” said Jim Amelung, Barnes Industrial Group President. More information about the Keystone product line is available at www.givenhansco.com. Purchase inquiries should be directed to Barnes Industrial Group at www.barnesindustrialgroup.com. Once an order has been partially shipped, use the Trip Time Analyzer to calculate average trip times and fine-tune the order with one click. By entering a Keystone User Id for a salesperson, that Keystone user will only be allowed to view that one salesperson’s data on most sales reports. Converting Units of Measure between types (i.e. Weight<->Volume) is much improved through the addition of the “U/M Conv” tab in Product Maintenance. This allows you to add product-specific conversions in a very user-friendly way. As part of our continuing evolution of our Document Imaging solution, this release significantly improves the foundation of Document Imaging to allow us to more easily support other document types in the future. We highly recommend that all Keystone customers install this update. There is a significant correction that should be mentioned here. As of Keystone 2.6.1 void tickets were not being carried through the invoicing process into sales history. This has been corrected in this release. Click here for the complete release notes for Keystone 2.7. If you are updating from a version of Keystone prior to 2.5, remember to follow this procedure when updating on a Windows 7 PC. Yesterday, GivenHansco donated $82,000 worth of computer software to the Concrete Technology program at Rhodes State College in Lima, Ohio. This donation will enhance the Concrete Technology program by exposing students to the Keystone Integrated Advantage, a state-of-the-art system which includes concrete batch controls and dispatch and accounting modules together on the same platform. Students will be able to learn about concrete technology “hands on” and will gain knowledge that will be useful in their future careers in the concrete industry. Since the previous post regarding version 2.5.11, many improvements have been made to several Keystone modules. The Dispatch module has been enhanced with new support for Returned Concrete. It has also been optimized for better performance. This is only a partial list of the improvements made since version 2.5.11. Click here for the complete release notes for Keystone 2.5.24. This version of Keystone includes a new Purchase Order module. This module allows entry and printing of Purchase Order forms and incoming product receipts. Receipts may be associated with a Purchase Order but do not need to be. Receipts are linked to an A/P Invoice during vouchering for automatic inventory and General Ledger updating. Click here for the complete release notes for Keystone 2.5.11. Come see us at the World of Concrete! Be sure to stop by the GivenHansco booth (North Hall #757) while you’re at the World of Concrete in Las Vegas next week. Mike, Ron, Don, Mark, Craig and Brett will be demonstrating our latest products and previewing some exciting new features still in development. Two of our newest modules available for Keystone Accounting include Document Imaging and Enhanced Financial Reporting. Keystone Document Imaging lets you scan and save your documents using a world class image recognition engine from KOFAX. Your documents are then easily accessible through KEYSTONE. There is no switching between programs, and it’s easy to view, print, or email documents with just a click! Keystone Enhanced Financial Reporting (EFR) allows you to create boardroom-quality, customized financial reports in Microsoft® Excel, quickly and accurately – with no re-keying! Keystone EFR delivers integration with F9, a powerful, easy-to-use financial reporting tool that dynamically links General Ledger data to Microsoft® Excel. We’ll be previewing some exciting new products at the show as well, including a new streamlined batch panel, a Purchase Order module for Accounting and a web-based Management Information Dashboard. The new Keystone batch panel has a more streamlined look and feel to it, while still keeping its simplicity and use of non-proprietary parts. The new design allows for users to decide if they want a physical manual panel or a soft (PC driven) manual panel. The Keystone Purchase Order module allows entry and printing of Purchase Order forms and incoming product receipts. Receipts may be associated with a Purchase Order but do not need to be. Receipts are linked to an A/P Invoice during vouchering for automatic inventory and General Ledger updating. Our upcoming web-based Management Information Dashboard is in the early stages of development. We’ll be previewing a very simple version and accepting ideas for information you’d like to see on the dashboard. Visit our web site at www.givenhansco.com for more information about Keystone. 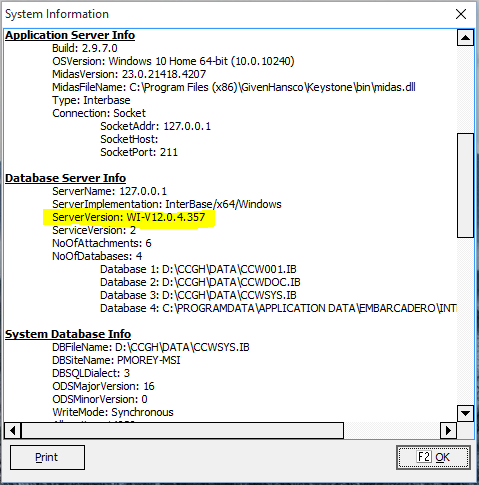 This version of Keystone includes an updated version of the Web Server. The map (which is displayed when locating a truck) now includes controls to zoom in/out. We have also improved the presentation on smartphones and tablets. We have also improved our handling of inventory transactions when mixing units of measure. There is also a Payroll fix regarding the Print W-3 Form option. Click here for the complete release notes for Keystone 2.5.3. This version of Keystone enhances the W-2 E-File Export option by adding support for the state of Indiana (including counties) and Ohio school districts. We have also added A/R customer style contacts to A/P vendors. This allows you to add as many contacts per vendor as you need to, along with individual email addresses and phone numbers. There have been several bug fixes in this update, including a critical fix for the Payroll ACH Export program when used with multiple Cash Accounts. Click here for the complete release notes for Keystone 2.5.2. When a user (who is connected to the Internet) logs in to Keystone, a new “Keystone News” window will appear next to the menu. This will contain the latest news & notifications about Keystone, including any critical updates that must be installed. There are several other enhancements and corrections included in this update. Click here for the complete Release Notes for Keystone 2.5.1. We will be posting specific information about our products and the industry. Please check back periodically for the latest information or subscribe to the RSS feed to get the latest posts delivered right to your browser.